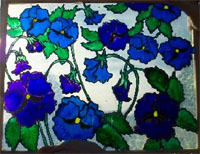 I have always loved stained glass, so when a local crafts store offered a "faux" stained glass painting class I signed up for it and fell in love with the process. I leaded and painted windows, panels, vases, and bowls using the patterns I purchased in books. I enjoyed that very much, but found that I wanted to be more involved in the creative process than just the painting. It was at that time that I discovered Glass Eye 2000 and took advantage of the trial period to see what it, and I, could do. 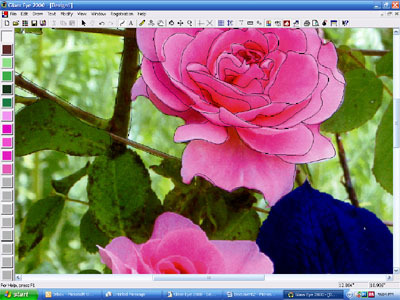 I then purchased the program and have since created many designs based on my photographs. 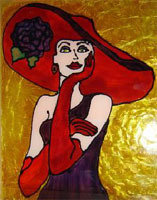 My husband was grateful when I started selling pieces at craft shows because he had been finding painted glass everywhere! I haven't been doing many projects lately due to my parent's illnesses. I was in a retrospective mood and browsing through my photographs when one jumped out at me. It was of roses from an old heritage style, with big heavy blossoms and a heady fragrance. My daddy was known for his beautiful roses, and he helped me grow this one, telling me how far to dig for the roots (not easy in North Carolina clay) and to place fish emulsion in with the water to give it a solid root system. Daddy always said if you try hard enough, and do your best, you can do anything. Daddy recently passed away, and I decided that my first project this year would be in honor of him. I have had Glass Eye 2000 for over a year now and just love it. The ability to take a photograph and transform it into a pattern and then resize it to meet my needs amazes me each time I do it. For anyone who thinks that they can't do this, you just have to try and see with your heart, and remember that you are your toughest critic. I feel awestruck when I hear people compliment me on work I've done using Glass Eye 2000. After importing a background image, I modify the line properties so that they are solid hairline in both face width and heart thickness. I also change the color to one that stands out against the photograph. I start in the top left, magnifying the photo and working my way "around" doodling right on top the photograph, interpreting it as I wish. I try to draw the lines so that later when I'm painting I can change the tones in the colors to give it more definition. I let the design "talk" to me. After tracing the photograph, I draw a rectangle around the perimeter and connect the outside lines to form the border. After that I apply the Suggest command. 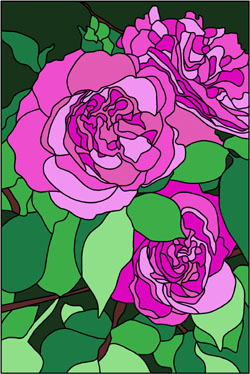 Even though I'm not constructing an actual stained glass piece, I still want my lines to connect for when I'm painting; for instance, I don't want the pink petal color to stray into the leafy green background. I then add colors to the piece to give myself ideas on painting it. Sometimes I like dark backgrounds, sometimes light — this is the time to "play" and come up with the right color tones. Once I have the colors the way that I want them, I print my design to a single sheet so I have a reference for my painting. Before I had Glass Eye, I kept copy shops busy trying to get the correct magnification to have my pattern the required size. Now I just measure the glass size and set the pattern to fit. Voila! I found that some clear plastic "shelf lining" works wonders for keeping patterns from tearing after they're put together. I especially love the ability to take my pattern that I might have done for a specific size window and resize it for another and have the proportions fit perfectly. 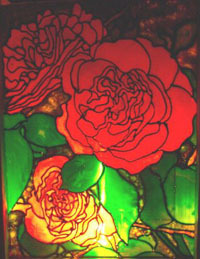 Mary has been creating hand-painted stained glass for over four years. She now has her own workshop where she paints every chance she gets. When not painting or designing, she works for Social Services, within the Adult Services Unit, where she feels blessed to help our elderly citizens receive hot meals and other assistance. Please visit her website or send her an email.